Each individual human life-form is made up of male AND female DNA. So too are our Spirits. Our Spiritual DNA is made up of a Heavenly Father and a Heavenly Mother; a God and a Goddess. It can be no other way. Without a male and a female, we cannot produce offspring. Once the physical act of creation is finished, a woman physically carries and incubates the child for a period of time. She then gives birth. Man and Woman should be regarded as sacred beings. For man is the bridge and woman is the gateway. Man bridges the gap between heaven and earth. He provides the other half of the genetic material that is needed in order for fertilisation to occur. Woman is the gateway to earth. Her body provides the development of the vessel in which our spirits reside. It is through our physical births that we can experience mortality. Spirit and body become one through the physical development of that child in utero. The physical union between man and woman therefore should be treated with the utmost care and respect. It should be regarded as a spiritual and sacred act not just a physical act of love and most certainly not a form of possession, power and control. Misusing this act is simply desecrating the Divine. It is desecrating the Divine purpose in which this act must be performed. The purpose is to show genuine and Eternal love for one’s spouse (husband / wife) as well as to provide mortal bodies for those spirits waiting in heaven. All things in life are mirrors of each other. There are parallels between nature and humans. All living things cannot be the same because if everything was exactly the same, we could not possibly exist. Photosynthesis and respiration are the same chemical processes but in reverse. Plants and humans / animals need each other in order to live. Without photosynthesising plants, we do not have oxygen. Without respiring humans and animals, plants do not have carbon dioxide. Man and woman have different roles in life. In a traditional family, one centred on God’s plan, man goes to work providing for his family and woman stays home, tending to the home and children. But that does not make her any less than man. Being a mother and a housewife is a fulltime job and is just as important as going out to work. The sun and the moon are parallels of man and woman. The sun represents the Divine Masculine Energy. The moon represents the Divine Feminine Energy. The sun gives light to the moon. The moon receives it. Man gives genetic material to woman. Woman receives it. The sun represents the physical. The moon represents the psychological. Man’s reproductive system is external. Woman’s reproductive system is internal. Man’s role is to protect and provide for his family. He goes to work and, if necessary, war. Water represents emotions and the water of the womb, it is also used for cleansing. Air represents intellect and the mind. – which are psychological needs. Water is also a representation of physical necessities, as is the case with the womb, it is the internal processes of the mother’s body developing a child in utero, but the physical nourishment of that child. Washing the body is also an external, physical necessity. Woman’s role is childbirth, physical nourishment and the teaching of her children. She tends to the home and family. In Wicca, the triple Goddess represents the Maid (representing youth), Mother (representing fertility) and Crone (representing wisdom). As Maiden, she is young and is in education and then she works to support herself. As Mother, she is married, she tends to the home and children. As Crone, she is older, she is wiser, and her children have all left home. Perhaps she is in retirement. She now has time to do other things that she may not have been able to when her kids were at home. She passes her wisdom onto others. Perhaps she writes a memoir. From the earth’s perspective, the sun remains a constant round disc in the sky, representing the constant of education and work in a man’s life. The moon; however, has eight distinct phases. This represents the different stages of a woman’s life. The above Maid, Mother, Crone example is the ideal. But life is never ideal. There is opposition in all things. There will be times when a woman needs to work whilst she is married. Her husband may be sick / unemployed, or they may be struggling financially, and so she must help provide resources for her family. They could be separated through his death, through divorce or even because it is too dangerous for her to stay in the marital home. She must now support herself and if there are children involved, she must be able to protect and provide for them as a single mother. It’s not that a woman must stay at home and should not be allowed to work, but more she should not try to have or do all these things in one go. There is a time and a season for work, for marriage, for children, for retirement, and as there are different phases of the moon, the roles of a woman change depending upon the current season of her life. Man and woman have different biology so they are most certainly not the same, nor should they be. Their roles are different but they can, as and when necessary, be interchangeable in certain things,. 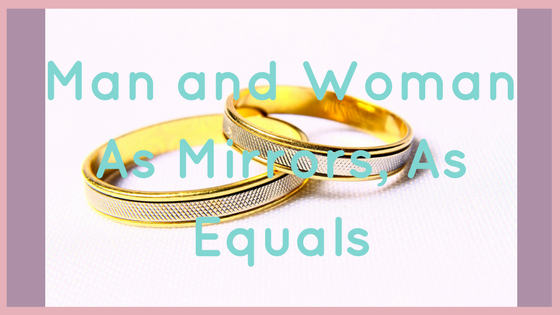 They are equal in God’s sight, even if society still has issues with the power and rights of women. Man is a king and woman is a queen and they should rule together in harmony. True equality is found in the balance and the unity of our differences not in the sameness of things.